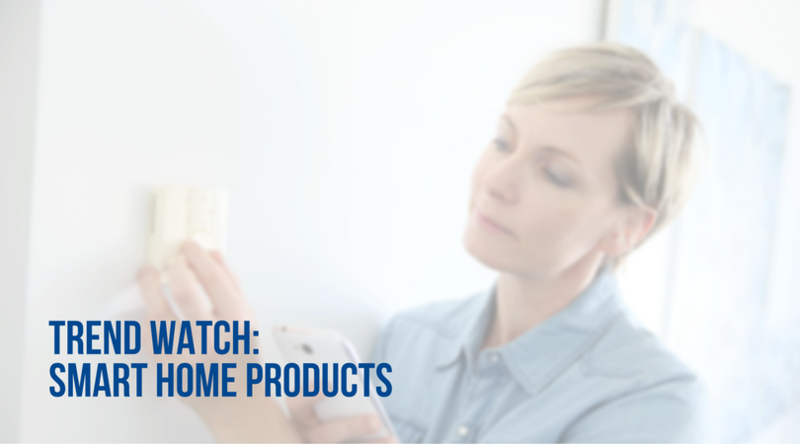 We know you’re well versed in the world of thermostats by now, but there are a few smart home products that you probably don’t know about. Technology is constantly evolving, and so are its benefits for your home. Check out these hot and new gadgets that can help make your life a little easier, and your home a little smarter. Ever forget your garage door opener at home? Or can’t seem to find it while digging through your center console and driving? Chamberlain offers a MyQ garage door opener system that connects directly to your smart phone. You simply tap your device, and you can open or close your garage door from anywhere (1). If you’re wondering if your system will connect, MyQ can operate with virtually all the main brands of garage door openers manufactured after 1993 (1). Safety is often the number one priority in any home; thus, it’s important to remember to always lock your doors. However, it can sometimes become a hassle if you forget your key, or even unsafe if you have to leave the front door unlocked for a family member coming home later without a key. Kwikset has developed an electronic deadbolt, called the SmartCode 916. Unlike other locks, the SmartCode 916 is small in size and less noticeable (1). The system operates with electronic access codes; you can assign friends and family permanent codes, while you can give temporary codes to guests that only work for specific time periods (1, 2). Sleep Number beds have been on the market for years, but they’ve just recently developed a new bed called It. In addition to having adjustable firmness like all Sleep Number beds, the It Bed connects to your smartphone to help you sleep better. It connects to an app on your smartphone called SleepIQ, which allows you to control your comfort, track your sleep, and improve your sleep by monitoring your heart rate, breathing rate, times of restlessness, and more (3). Parents with little ones are always checking to ensure their child’s health is at its best. With Hatch Baby’s new Smart Changing Pad, parents can easily track their infant’s health metrics right from home. It serves as a regular changing pad, but also has a built-in, wireless smart scale which helps keep tabs on the baby’s weight, diaper changes, food intake, and more. All of this information is tracked through an app accompanied to the pad, which can be shared with a pediatrician (4). Being at the grocery store and not being able to remember whether or not you have eggs at home in the refrigerator—an all too familiar experience for almost everyone. What if you could have your refrigerator send you pictures of its inside at any moment? Well, you can. Samsung has created a new Family Hub Refrigerator that allows you to order groceries, listen to music, watch television, leave notes for family members, and even view each other’s schedules through a touchscreen (1). One of the more popular smart gadgets that has emerged in the past few years is called Google Home. Google Home can control other smart home devices, stream music, and perhaps most impressive, can respond to voice commands (1). Don’t feel like setting your alarm for the morning? Tell Google Home to do it. It can even detect different voices in your home, which offers you a more personalized experience (5). Are you always the first one to finish at the dinner table? Eating too quickly can actually make you gain weight. Because it takes your body about 20 minutes to send signals of fullness to your brain, you might not feel full if you’re eating too fast (6). The HapiFork is a Bluetooth-enabled utensil that can sense when you’re eating too quickly, and will vibrate when this happens. It might sound silly for some, but it offers a solution to a serious problem for others (4). Would you use any of these innovative new products? Let us know! Call the experts at Greater Comfort today to ensure that your thermostat is making your home smarter by working as efficiently as possible: 859-491-4915.